The board was formed in 1987 after a spike in police killings, and given the charge to review police department investigations of improper conduct. But the board’s members say the tools available to them are inadequate, and the scope of the board’s authority should be broadened. Police Chief Renee Hall agrees. She told the council that from the moment she arrived in 2017, it became clear that many Dallas residents didn’t have faith in the board’s ability to improve policing. “When a community speaks, regardless of who they are, it is our responsibility as a police department to listen. And that voice got louder and louder every meeting that I had,” Hall said. The chief said she’s spent more than a year talking with community activists, police officer associations, members of the review board and other stakeholders about how to make the review board effective. The changes she proposed at the meeting, she said, were a compromise intended to provide the board with more independence and authority, and ensure accountability and transparency. They included shrinking the number of board members, giving them more training and a budget to hire staff and investigators, and giving the board broader authority to investigate and review internal investigations of alleged officer misconduct. The proposal also called for a separate sub-panel, which would also include clergy and members of the department’s advisory boards, to be set up as a board subcommittee to monitor investigations of high-profile or critical incidents like when an officer kills a civilian. As soon as Hall wrapped up her presentation, though, it was clear that her compromise proposal wasn’t winning enthusiastic support from community groups, rank-and-file cops, or from the councilmembers themselves. Dallas Police Chief Renee Hall talks with Dallas Police Association President Mike Mata ahead of a presentation about expanding the authority of the Dallas Citizens Police Review Board. “The changes that are being proposed here are very wrongheaded and I will not be supporting any of them,” said Councilman Philip Kingston, who called the review board “structurally incapable” of doing real oversight and lambasted Chief Hall’s proposals for leaving it relatively toothless. Several councilmembers joined Kingston in expressing support for a stronger board, even if they weren’t fully on board with the specific changes on the table. Councilman Kevin Felder worried shrinking the board’s size would leave neighborhoods unrepresented. Councilwoman Carolyn King Arnold said she had questions about the decision not to give the board the power to subpoena officers. Hall said the officers would be compelled by the department to testify instead. Councilman Casey Thomas, who has been involved in shaping the changes, expressed support for the changes, and Councilman Adam McGough called the proposal “a good start,” while acknowledging more work was needed. Councilwoman Jennifer Staubach Gates said her constituents had talked more about concerns that shrinking department are slowing police response times than about civilian oversight, though she said she was open to making changes. Councilman Rickey Callahan wondered if there isn’t already enough police oversight, between the department’s internal affairs process, civil and criminal courts and the existing review board. “Somehow, it always seems to work out. Justice does not always prevail. But most of the time it does,” Callahan said. The council chamber was packed with people, split on the idea of increasing police oversight, and after the meeting ended, tensions between the two sides devolved into a shouting match outside the chamber. Members of a coalition of left-leaning community activist organizations that have been working to reform the board clashed with members of the right-wing Citizens Matter group who’d come to opposed the changes. 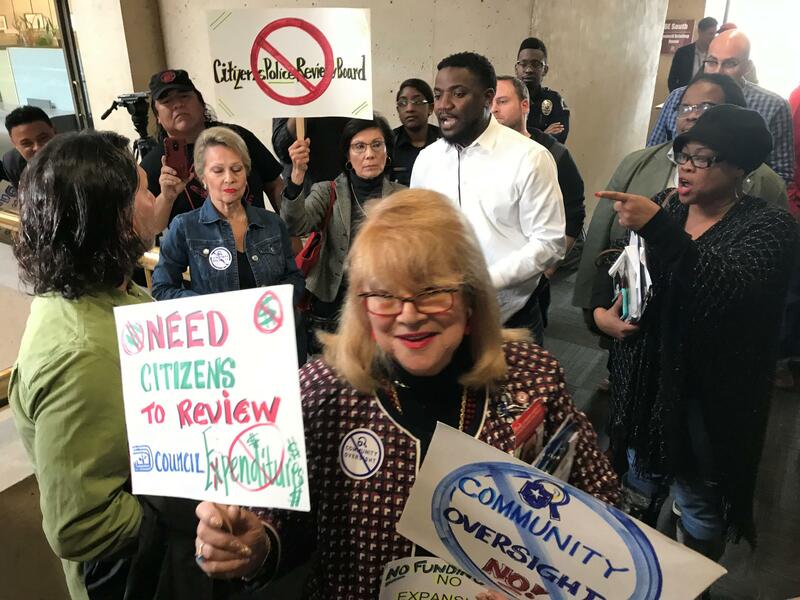 Advocates for and against the idea of strengthening the Dallas Citizens Police Review Board shouted at each other outside the city council hearing room. “Look what’s happening over here – you got people yelling at each other. They’re not talking to each other, they’re not listening to each other. Nothing gets solved that ways,” Dallas Police Association President Mike Mata said, saying the process has been divisive. Mata says he’s fine with many of the proposals – but worries a strengthened board could leave officers accused of wrongdoing stuck between two investigations – one by internal affairs and one by the review board. Changa Higgins from the Dallas Community Police Oversight Coalition says the push to reform the review board isn’t anti-police. His coalition has been working with the Chief Hall on the recommendations, but he says what she presented at the meeting did not match up with what he’d expected. Some of the proposals were workable or close, he said, but others fell short. “We don’t want to go back in and just have a rebrand and a redesign of what we already have, we want to make real transformative change,” he said, saying it was inappropriate to have the police chief leading the discussion about the powers of a board charged with reviewing her department. The chairman of the police review board, and a cheerleader for its reform, was diplomatic. Dr. Brian Williams said he and others on the board are “more in line with the coalition [of community activists] than the chief,” but urged patience as stakeholders get together to work out the details iron out disagreements. He cited particular concern with limiting the monitoring of the most combustive critical incidents to a separate panel. “We need to ensure that the citizens feel confident that there’s a thorough, fair investigation that is looking to get to truth at the end of the process,” Williams said. The full city council is slated to review the proposed changes in March, but after concerns expressed by councilmembers, community groups, the police association and board members, a postponement seems likely. At a time of high tensions between police and the public, the Dallas Police Department would seem to be a success story: While some other big-city departments draw thousands of citizen complaints every year, the nation's eighth-largest gets only a fraction of that number. 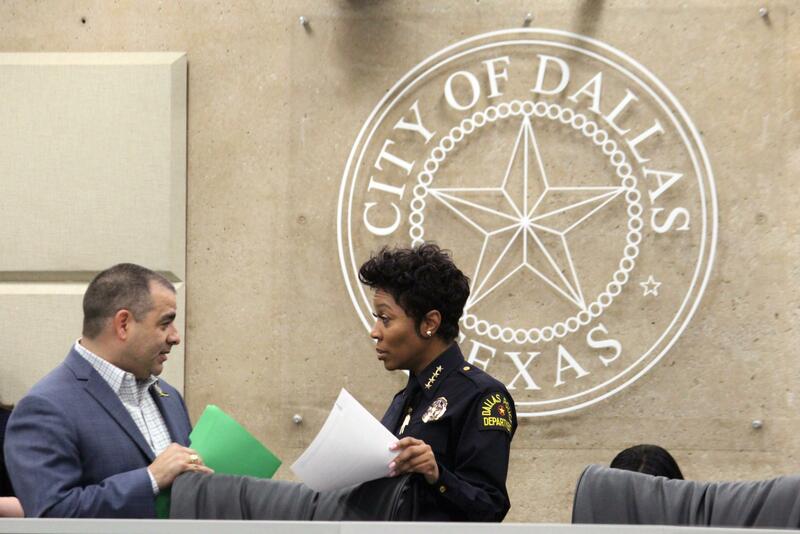 Dallas made a landmark hire this week – Renee Hall will be the first woman to run the city’s police department. Now serving as deputy chief in Detroit, Hall is determined to make her mark in Dallas not just as a woman, but as a standout leader.